"Thanks again for helping me fix my Ubuntu installation, Barbie!" Steven beamed. "No problem, Steven. Did you remember the USB drive I asked you to bring?" Barbie asked as she opened the laptop's disk drive to insert a Ubuntu live CD. "Yep! I just left it in my bag. I'll go grab it." Steven responded. "Great! Then we can back up all of your files, and then I can reinstall Ubuntu onto your laptop." Barbie had been using computers since she was very young, and was known as a computer expert among her friends. Steven was estatic! 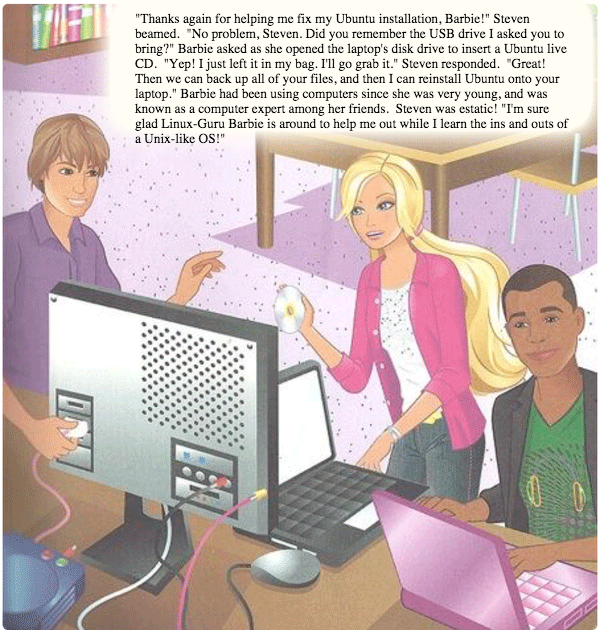 "I'm sure glad Linux-Guru Barbie is around to help me out while I learn the ins and outs of a Unix-like OS!"